Young string students will experience the excitement of playing in an orchestra, make new friends, grow musically, and have fun! Budding young string students can play in a fun string orchestra day camp where they’ll experience the excitement of playing in an orchestra, make new friends, grow musically, and have fun! Rehearsals, sectionals with professional coaches, fun social opportunities, field trips, and special music activities create a well-rounded musical experience. Open to any violin, viola, cello, or bass students ages 8 – 13 who have approximately two years’ playing and reading experience – no audition! Daily field trips to Minnesota Public Radio studios, Schubert Club instrument museum, the Ordway, and more! Each camp is capped at 50 students. Register early: $20 discount for students who register before May 30! 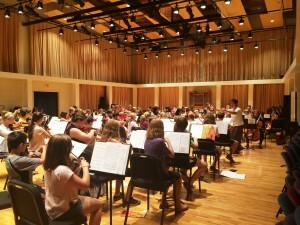 Registration for the 2019 String Orchestra Camp is now open.